Democrat Janet Mills addresses supporters in Portland after winning the Maine governor's race. Alan Caron, the independent candidate who dropped out of the race and endorsed Mills, at Mills' election night event. Lines remain at voting places mid morning. The warden at the expo polling location says before typical work hours the line stretched down the block. A bipartisan group of candidates for town council, school board and statewide office surround Republican gubernatorial candidate Shawn Moody in Scarborough. For approximately two hours this morning the line for voting at this Portland location remained this long. Looked like there was a fair number of people who were registering today as well. It's Election Day, and Maine Public's news staff is out in the field covering the races. Check back here for local updates and the latest from our reporters, as well as national updates from NPR. Click here to jump to NPR's live blog. A spokesman for Republican Eric Brakey has issued a press release indicating that Brakey will not concede in the race for U.S. Senate. As of writing, the Associated Press has called the race for incumbent independent Angus King, giving Brakey 36 percent of the vote to King's 54 percent, with 69 percent of precincts reporting. The Brakey campaign pins its hopes on King's share falling below 50 percent, which would trigger an instant runoff under Maine's ranked-choice voting system. That's a fate the 2nd District race seems destined for, with incumbent Republican Bruce Poliquin and Democratic challenger Jared Golden deadlocked at 46 percent each. Janet Mills will be Maine's next governor, and the state's first woman governor. Republican Shawn Moody concedes the Maine governor's race. Democrats have taken the Maine Senate, Mal Leary reports. Jared Golden told supporters it's going to be a long night, and results won't be likely known right away. "It's going to be a late night, we're not going to get any final resutls tonight," he said. "But let me tell you this - we're winning it right now and it looks like Mainers are that much closer to getting that new generation of leadership." Meanwhile, Golden's Republican rival Bruce Poliquin, was also telling his supporters to expect a long night. Patty Wight says supporters of the home health care initiative aren't feeling discouraged, despite early returns that aren't going their way. 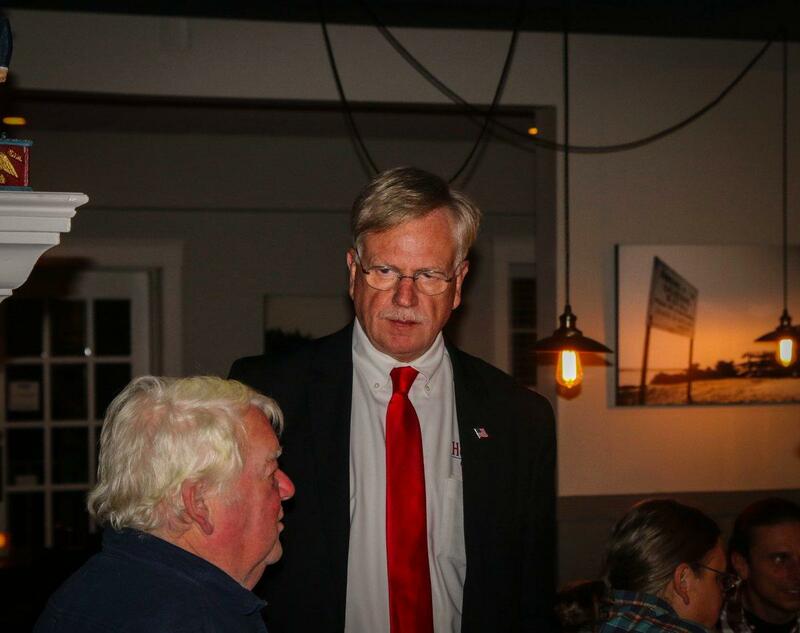 Fred Bever is at Sen. Angus King's headquarters at a Brunswick brewery. About 100 supporters of the incumbent independent have gathered there, as King holds a solid lead in early returns. Harpswell resident Liz Iscze joined the crowd. “I like his approach to thinking. I like his approach to listening and I think he’s the real deal," she told Fred. King has challengers on the right, Republican Eric Brakey, and on the left, Democrat Zak Ringelstein. If voters approve Question 1, a tax will be levied on higher income earners to pay for universal home care. Opponents have criticized the tax, and say the program won’t be able to deliver what it promises. 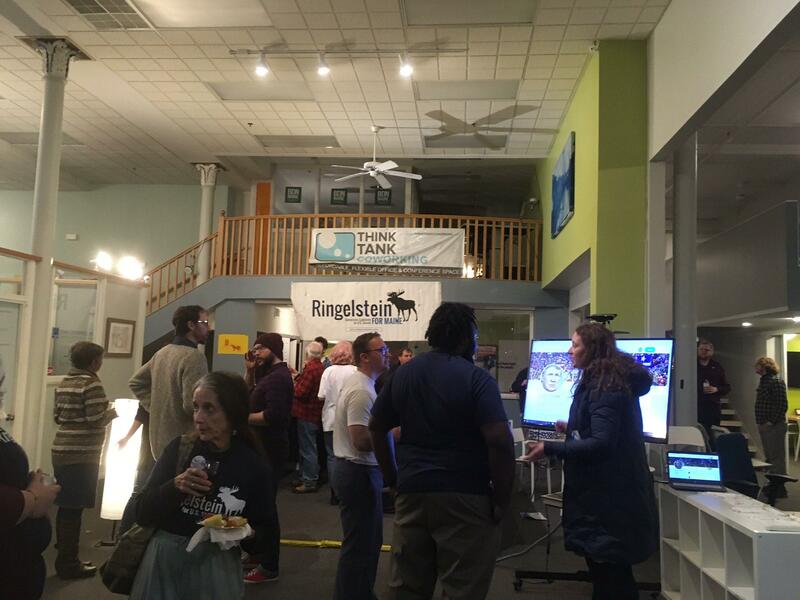 Robbie Feinberg sends this photo in from Think Tank Coworking in Portland, where Democratic Senate candidate Zak Ringelstein's supporters await the candidate. Zach Heiden of the ACLU of Maine says Justice Warren has ordered the Italian Heritage Center polling place to stay open until 9:30, after a car crash disrupted voting. The polls are now closed in Maine! We'll bring you the results live, as they come in. Steve Mistler is keeping an eye on what's happening at gubernatorial candidate Janet Mills' campaign, which is set up at the concert venue Aura in Portland. 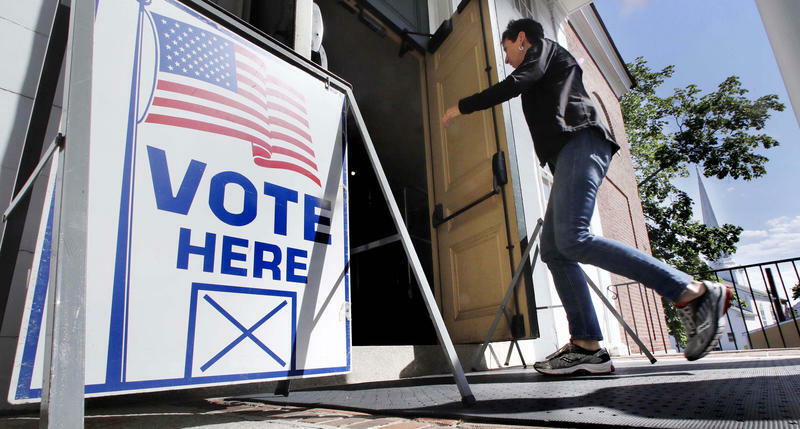 Maine Secretary of State Matt Dunlap says voter turnout in the state appears on track to break the 2014 midterm record - but whether it will reach the 70 percent level often seen in a presidential election year remains to be seen. 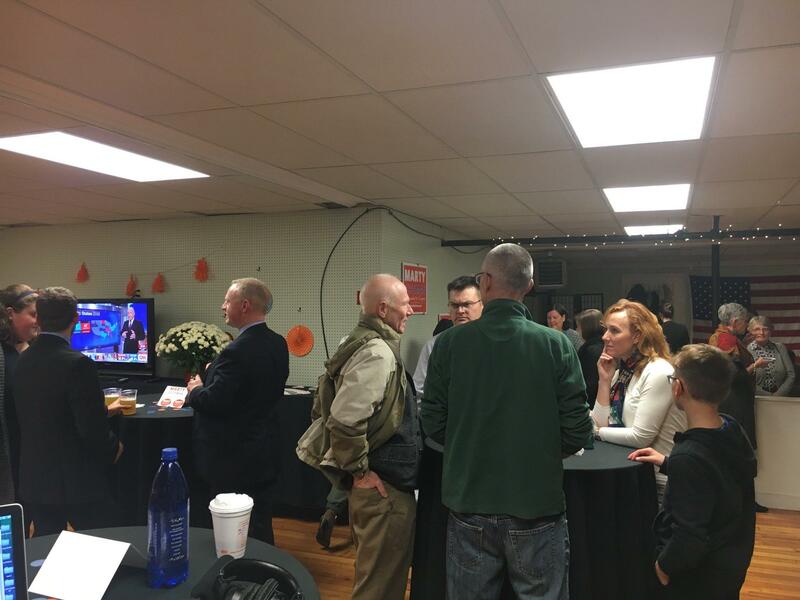 The AP reports that Secretary of State Matt Dunlap says that he's receiving reports of a strong turnout, in line with projections. Dunlap expects up to 65 percent of the voting-age public in Maine to cast tallies in Tuesday's election. That includes more than 170,000 people who cast tallies via absentee ballot ahead of Election Day. Good morning! Maine's polls close in 12 hours, so you've got plenty of time to get out and vote. It's still quite early in the day, so check back throughout the morning and afternoon for updates. Things will heat up after polls close, and we'll have reporters at quite a few of the candidates' election night parties. If you're looking for a quick rundown of Maine's races before you hit the polls, we've got your guide here. If you've already voted and are looking for some context, at 1 p.m. we'll discuss the history of Maine elections on Maine Calling. And for even more information and resources, check out our Your Vote 2018 page.